Melanie Mikeska is a retired Sheriff’s Deputy of 20 years. 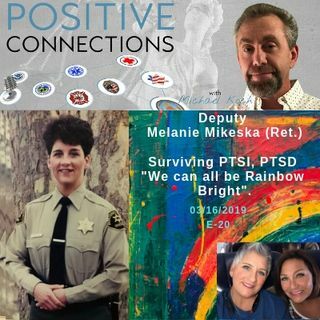 Like the vast majority of First Responders, Melanie experienced many critical incidents and learned that showing emotions is a sign of weakness. Over time, the stuffing down of emotions and feelings became overwhelming and she found herself alone in her bathroom with her service handgun. Melanie describes the crippling effects of PTSI and living in fear because of shame, guilt and stigma. In 2013 Melanie reached out for help and ... See More was diagnosed with Post Traumatic Stress and has spent the last 5 years recovering from this injury. Melanie is married to her beautiful wife of fifteen years and has three children and seven grandkids. She enjoys poker, hanging out with family in her backyard and pool, traveling and spending time at the beach. Melanie is on the show to stand up and speak about her life in recovery so others who are suffering in silence can see that they are not alone and there is a way out.